Almost 80% of the Senate (78-20) just voted for a measure that would cite foreign nations for manipulating the value of their currency, although the enforcement of any penalties was not and will not be addressed. But the real purpose of the vote was to give Democrats license to vote for Fast Track authority without seeming to be enemies of the middle class worker and the small businesses of the United States. The illusion will probably stick, as many hail this “bipartisan” action as the way to markedly reduce unfair trade practices – particularly by China. Even the Washington Post, owned by Amazon’s CEO, explained: “… economists say such ma­nipu­la­tion is no longer prevalent and that the longtime poster child of currency ma­nipu­la­tion — China — has gradually stopped doing it.” So much for reality, when politicians have a chance to curry favor with big multinational benefactors for campaign cash and future lush (two martini lunch, anyone?) private sector jobs. The real cause of our trade imbalance begins with tax policy, especially U.S. tariffs and China’s 17% Value Added Tax (VAT). The deal is that we have virtually eliminated tariffs for China’s exporters to the U.S. (mostly U.S. products made overseas – cell phones, computers, televisions) and China does not impose a VAT on these exports from that country. When U.S. exports arrive in China, they generally are hit with that giant 17% tax – a necessary source of income for more Chinese missiles, tanks, nuclear subs and aircraft carriers to harass their neighbors. It also helps keep taxes low for China’s workers and businesses – allowing such frivolous (in GOP opinion) extras that include nearly free healthcare, higher education, childcare and nursing homes – items that eventually can consume all the savings of an American household. 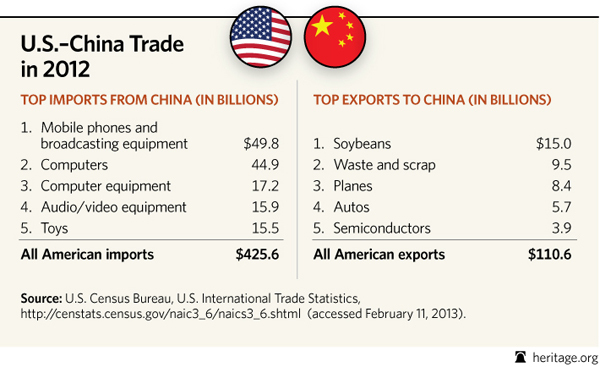 The chart above shows imports from China were almost four times the value of exports, despite the World Trade Organization promotion that we somehow benefit from getting no taxes to the government from imports and are not competitive in China because of taxes added to our products sold there. Here is an example. A tv manufacturer in Delaware (there are now none in the U.S.) builds a set for $300 and sell it for $500 in the U.S. There is no sales tax in Delaware, so $500 is the price to the consumer and allows a $200 margin for the manufacturer. The company here decides to expand its market to China, and send the same televisions there. At the Chinese port the government collects $51 VAT, meaning the set selling there at $500 will have only a $151 margin. A company in China decides to compete by selling in the U.S. The same $300 cost-to-build set arrives in the U.S. and goes tariff-free to the customer here at a price of $500, allowing a $200 margin. At the point of sale in China, both the imported and locally-built tv will be hit with the VAT, making the prices exactly the same. A company in the U.S. selling here and in China will earn $151 on sets sold in one country and $200 in the other country. A company in China will earn $200 selling in either country, both selling at the same price. Which would you choose to finance? Which one will attract the capital for new and better factories, improved infrastructure? Which country would find their manufacturing companies and workers abandoned by Wall Street and the hedge funds? Just another example of what happens when you follow the money. We should stop calling our elected government representatives legislators and call them Wall Street enablers.